This is a rare old rum from Guyana. Demerara Distillers have over the years collected a number of unique stills at the Diamond plantation. This way they can still produce many old styles ("marques"). One such marque is EHP, originally produced at the Enmore Sugar Estate. The owner of the plantation was Edward Henry Porter, hence EHP. The EHP style is produced on a Wooden Continuous Coffey Still that has been in operation since 1880. It is the last Wooden Coffey Still in use! I would love to see that one day! All El Dorado rums are made from molasses. Now some might wrinkle their nose and say that "real" rum should be rhum agricole, made from sugarcane juice. Well, El Dorado certainly proves them wrong. The El Dorado Enmore 1996 has been matured in ex-bourbon barrels, and aged for the full 21 years on site in Guyana. Yes, this is actually 21 years old, it is not just a random number on the label. It was then bottled at cask strength in 2017. 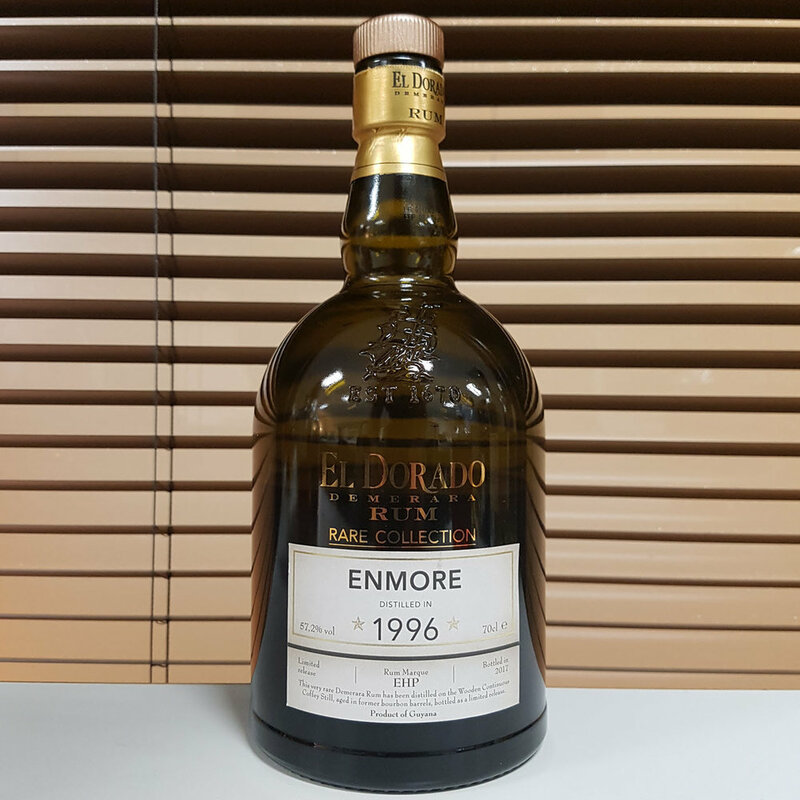 You can buy the El Dorado Enmore 1996 at specialist stores in Norway now at NOK 1800 (10190001). Nose: Dark and delicious! Dried fruits, demerara sugar and hints of vanilla. The sweetness is deep, refined and a touch challenging -but not funky! Taste: Very rich mouthfeel and full-bodied. Scary good stuff! Again the demerara sugar and dried fruits. Hints of something green - a touch herbal. Finish: Long finish. Homemade caramel pudding with a super rich (and slightly burnt) caramel sauce. So, so rich all the way. Comments: Well, ho-ho-ho and a bottle of rum. This is a pirate's treasure in itself!